The 2013 tennis year was one of the most even years on record since the emergence of the “Big 4” of Roger Federer, Rafael Nadal, Novak Djokovic and Andy Murray. This showed especially when examining the results of the major tournaments. Djokovic captured the Australian Open, Nadal took his favoured French Open crown and the season ending US Open and Andy Murray delivered the wishes of the British public by being crowned Wimbledon Champion. Only once in those four finals did someone from outside the club, David Ferrer, contest for a title, in the final match at Roland Garros. So with that in mind, what are the big tennis predictions for the upcoming 2014 season? The Australian Open is a great place for my first prediction, as it is a tournament that traditionally throws up a surprise contender for the title who often goes onto success. The success of Jo –Wilfried Tsonga in 2008 in reaching the final when a virtual unknown or the show-stopping forehands of Fernando Verdasco in an epic 5 hour encounter with Rafael Nadal in 2009 are two recent examples. A brief survey of the top 20 men’s players also shows an interesting statistic. Of the 20, 17 are over the age of 25, with only three players younger. This means that as the list ages, the younger brigade are poised to make their mark by rising through the rankings and at the same time, taking wins from their more experience rivals. Of the young blood the two best placed contenders appear to be the giant Canadian prodigy Milos Raonic with his close to 2 metre tall height and booming service game that has some comparing him with Pete Sampras, and the young dynamo Kei Nishikori of Japan whose court coverage and drive to win every point are reminiscent of Rafael Nadal. 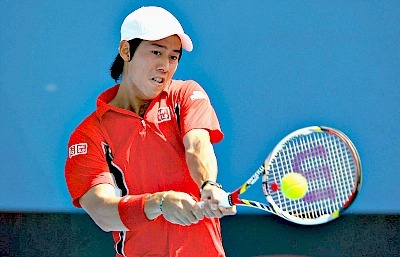 Another positive for Nishikori is the addition of former US top ranked player Michael Chang to his coaching ranks, meaning that the big match experience and skills of the legendary American are well and truly at his disposal. I would look to both of these players to make a mark during the Australian summer and grow during 2014. Of all the tennis predictions, this is the boldest one that I am going to make. I believe that 2014 is the end of the big 4 that has dominated men’s tennis for so many years. This should become especially apparent at the French Open and Wimbledon during the middle of the season. Turning to the elder statesmen of the group, Roger Federer, it is clear that the Swiss master is past his best form. In the year just gone he only managed to win one tournament succumbing to a string of losses to unheralded opposition and failing to reach a grand slam final for the first time in many years. While he will not be dominant as he once was, I would look for him to target the tournaments where he has fond memories and a good history for wins as he looks to improve on 2014 results. There are rumours around the tour that he may consult Stefan Edberg, the Swedish maestro of the 80’s and early 90’s to assist him in achieving this goal and mentoring him through 2014. My prediction for Roger is that he will remain in top 10 but unlikely to go back top 4 in 2014. Rafael Nadal also seems like a candidate to have a more difficult 2014. This might seem odd considering he won the most majors in 2013 and also had one of his most dominant wins in the French Open on record. However, his well-documented struggles with injury and his problem knees are likely to remain an issue, and any re-emergence of these ailments will weigh heavily on him. What this is likely to mean is that Nadal becomes more selective in the tournaments he contests, and as a result is more fiercely competitive in every match, rather than taking the route of earlier years with his punishing year round schedule. Contesting less tournaments might mean that he struggles to hold a high ranking, and may run into higher seeds earlier in tournaments, however, the added benefit of being fresher is likely to help overcome these hurdles. Of those currently outside the Big 4 the man most likely to ascend to that level is the sleeping giant Juan Martin Del Potro. After his punishing US Open win in 2009 many marked him as a consistent finalist in Grand Slams. While this has not happened, Del Potro has been steadily building his game with marked improvements in fitness and court coverage compared to those earlier years where he relied on his huge serve and forehand to win points. Novak Djokovic and Andy Murray appear likely to inherit the mantle of the leaders of the ATP Tour and are likely to craft a rivalry that mirrors that of Federer-Nadal in the 2000’s. This is especially true as Djokovic looks to rebound from a somewhat disappointing 2013 season where he missed many of the lofty goals he set for himself. He has engaged Boris Becker to be his head coach, hoping that the former champion can help his regain his number 1 ranking. With Ivan Lendl with him, Murray looks to build on his most successful year to date and elevate himself to the number 1 ranking. Look out for the US Open at Flushing Meadows to be the site for a titanic struggle between these two that establishes the start of a new era in men’s tennis. Whether these tennis predictions come true or not, I can’t wait for the new year of tennis, and I know you can’t either! From "Tennis Forehand: Powerful Tip To Allow You To Have More Power and Control" To "How To Play Tennis Efficiently And Become A Better Player"